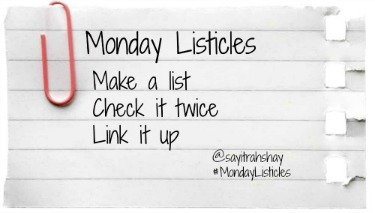 #MondayListicles Clears the Clutter - Say It, "Rah-shay"
it’s another week and another go at Monday Listicles! Now then: Make a list, check it twice, add some bling and link up! I had to admit that that dress I got from The Goodwill, while a great bargain, was really a waste of money since it was not getting used as it sits in my closet, you know, not being used. So farewell funky green dress that was going to be my goal dress for Fall and then Winter and now Spring that didn’t really fit well when I tried it on but I justified it bu sating it would EVENTUALLY look good when I did the crunches I still have not done. This dress, along with the drawers of tee shirts that I don’t wear and know I am not going to make into a quilt just has to go. Ten years ago those platform shoes were my favorite. It made me taller, made my legs look a little bit longer and made a satisfying clomping sound when I walked anywhere with hard floors. Alas! The strap broke, I tend to pronate when I walk and my once funky clogs are just funky and tired and need to go. I need a moment of silence for these. She who has the most yarn doesn’t win, she just has a bunch of yarn. A few weeks ago I bought a bookcase from a friend and it’s a cool one like from Ikea that’s all cubed and reminiscent of a yarn shop and looks good and is full of yarn I am not even using. I like, OK love the idea of having a large stash but what good is that stash if it’s just sitting unused? I admit that I made a purchase of yarn because I had a coupon, (I would have lost money if I had not used that coupon…duh!) but yeah…that is really no reason to buy yarn just because. So. When I moved there was a closet that was like a catch all closet and it’s full of rusty tools, old paint, some tiles, junk. It’s been on my mean too list to clean it out because that closet can be used for some many other things. Like books and cleaning supplies and games! I would love to store all of our board games and video games in that closet. This seems to be a perpetual problem. I was lucky enough to score tickets to Book Expo America and STILL have books from last year. Add to that the review books I get plus the books I am judging for the committee I am serving on and that is a lot of damn books. I gave a bunch away during the holidays, took even more to work but there are still shelves and shelves of books that I just need to admit that I am NEVER going to read and then just ser free. I had it in my mind that I was going to spend time making crafts. The Bee and I would bond over mod podge and glitter. Nope. Not even a little. We have a bunch of old boxes, container and jars that were rescued in the hopes of repuposing them for some Pinterest worthy crafts. We now have dusty boxes, containers and jars that are NOT being crafted with. I have two crock posts, three coffee makers, two mixers blenders and probably cook twice a week month (kidding. Maybe three times a month). I love gadgets but since I am not using them I need to free up the space and let them go. Once upon a time I got a mess of tiles and was going to re-tile the bathroom. Fastworward to now and not only have I NOT re-tiled the bathroom, I have let a perfectly good container not be used. Part of me feels that since they were free I should keep them but the other part of me knows I need to just put them out for the junk man. That’s my start. Click through to Kelly’s post for her plan. Share the news and don’t forget to link up with Monday Listicles! Until then, grab some boxes!